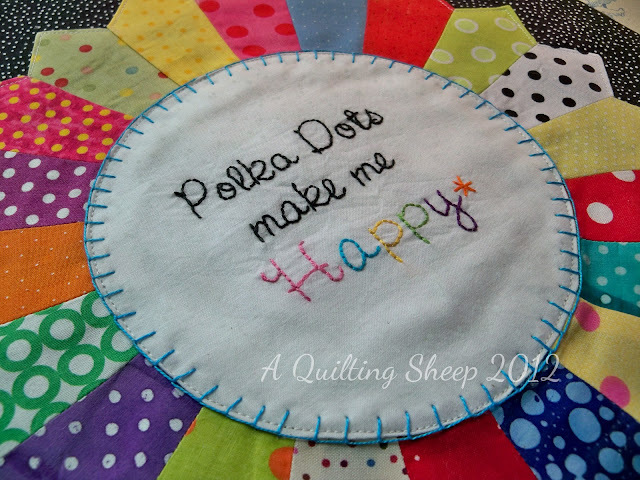 A Quilting Sheep: Time for Dots on Dots! And I have been loving hand stitching lately. Thanks so much for stopping by and I hope you will come back again! 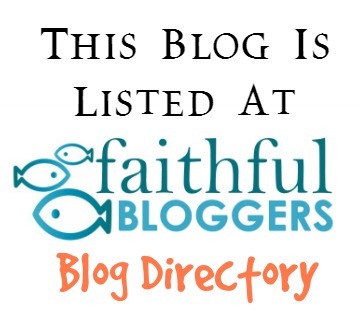 Really like your blog, thanks for sharing it! Oh this would make a sweet pillow. Thank you for sharing today. Love your Dresden Plate! So bright and cheerful. Love the embroidery addition. I vote for a Ackfeld hanger. Thank you for sharing. What a bright and cheerful Dresden Plate, you stitch beautiful, its a great combination. I wish you success to make the decision what to do with this great block. Thanks for showing. Oooh love your dots - they look really effective on a dresden plate dont they! Thanks for sharing. Amy I love dresden plates too! I think you should make more then you don't have to choose between a cushion/bag/wall hanging!! What a wonderful pillow your "dotty" work would make! Thank you for sharing with us. Debby from Northern VA, too near the politicians, but not close enough to give them all a big smack in the head! Your dotty Dresden plate would make a great pillow.The dots look really good. Thank you for sharing. I vote for a pillow. That is the cutest Dresden ever. love your dresdan.would make one cheerful tablerunner. it will make any project that it is put into, look good. Your block is fun fun fun! Thats 3 for 3. wonderful idea. thanks for hopping with us. Your block is adorable! Love the plate with the embroidery! A beautiful block, love the black dot background, it makes the colours pop. hum... my vote go for the tote! beautiful block Amy. love all those colors! Such pretty stitching, thanks for sharing! I like stitching by hand too. Yours looks fantastic! Super cute! Your embroidery is lovely. I love your hand stitching! I think this would make a fabulous tote bag or a pillow case. Great job! Wow! What a wonderful block! I big tote bag would be great with this block! Very nice! I like your colors and the embroidery. Thanks for sharing. I enjoyed looking at the other sites, but I must admit I am a bit partial!!! Really like you addition of embroidery!!! VEry nice !! Very cute.A tote bag will be nice with this beautiful block.Thanks for sharing!! Your block is beautiful. I love the blanket stitch that you added around the center! Beautifully done! I think this block would make an adorable tote bag! How sweet! I think this would make a cute pillow and your embroidery is wonderful! I like your dotty Dresden Plate and I'm sure whatever you make with it will be lovely. Looks like summer fun!! Love it!! Your block makes me really happy, too. It will be beautiful where ever you decide to use it.Thanks for sharing. Oh that is just absolutely adorable! What a great, fun block! Super job! I love the embroidery and all the colors! I LOVE the dresdan plate! I would either make a tote or a mug rug or coaster. No matter what you make, it will be fantastic. I love the bright colors and all of the dots! The embroidery work really makes it stand out! And such a very fine job of hand stitching you do too ... beautiful block! Amy, it's wonderful to see you on this hop and thank you for sharing!! Bless you this day! You are right. This is a great combo! Love it! Hi!!! Sew pretty and cheerful!!! So cute. That's a lot of dots. I love hand stitching too. It would be cute made into anything! I think it's beautiful! I love the embroidery, too! 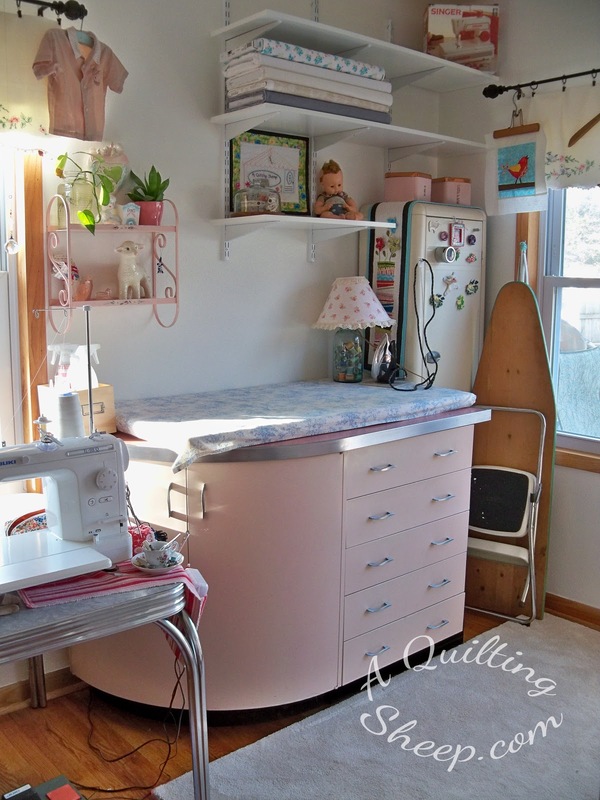 It might be nice just stretched across a canvas and hung on the wall in your sewing room! Beautiful dresden. It is hard to decide what to do with one block. I have a nice table topper holder so I usually make it for that. But a tote would be so nice or put it on the back of a shirt or jacket! Everybody loves the dresden plate. How about a little wall hanging? Very cute and I love the Dresdens with the dots. Your block makes me happy !!! Very nice. Love the happy colours in your dresden. I see this as a wallhanging or tote! thanks for sharing. Hee hee - baaaah! The dresden is perfect for the dots! I think it would make a great tote. Great job and thanks for sharing! What a cute Dresden dot block. I think it would make a great wall hanging. 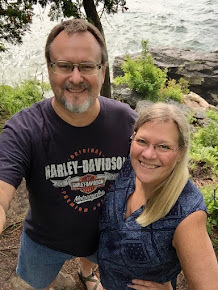 Your work is happy and cheerful - thanks for sharing in the blog hop!! I've never much liked dresdens, but seeing all these lovely dotty dresdens on the blog hop, I'm starting to fall for them! Quando o amor fala mais alto o "grito" ecoa pelo mundo,lindo trabalho.Eu "ouvi" aqui do Brasil,parabéns!Beijos e Bençãos. I love your dotty plates and your sweet stitching - very lovely! Cute.. Dots make me happy too.. Happy Hopping!! Love, love, love it! Great colors and the background makes the colors pop. Lovely stitching, cute saying. Thanks for sharing & congrats on being one of the chosen. A tote bag for sure! Your block is fabulous! I think your dots came out great. What a wonderful tote bag or pillow it would make! When you're happy, everyone's happy! Congratulations on a darling block. What a very lovely block. I'm thinking whatever you make it into, it will be fabulous. Your block is lovely and it won't matter where you put it....you'll probably always smile when you see it....I know I sure did. What a happy fun block! It's so great! If you make it into a tote bag, then everyone who sees you carrying the tote will be smiling too. A really fun dotty block and it would make a great tote ! I love your Dresden plate. Whatever you end up making will be beautiful!. Thanks for sharing. Your hand stitching is so perfect! And I love how your comments are "bleats." Polka dots make me happy, too. Your dresden is darling and whatever you make with your block it will be sweet. This is adorable. Thanks for sharing!! this one is def one of my favorites. a pillow would be really cute, or just a snazzy banner. I love it!! Now how cute is this. I think a fun pillow would be great, but then a tote, a table centerpiece? All of the above. This is just too cute. I personally would make it into something I would see all the time. Polka dots make me happy also. So beautiful! I just love it! Amy-Love your polka dots, from the border on your website to the dresden and kites. Almost everything you've posted has polka dots! Thanks for sharing, from California. Your project is gorgeous! Love it! 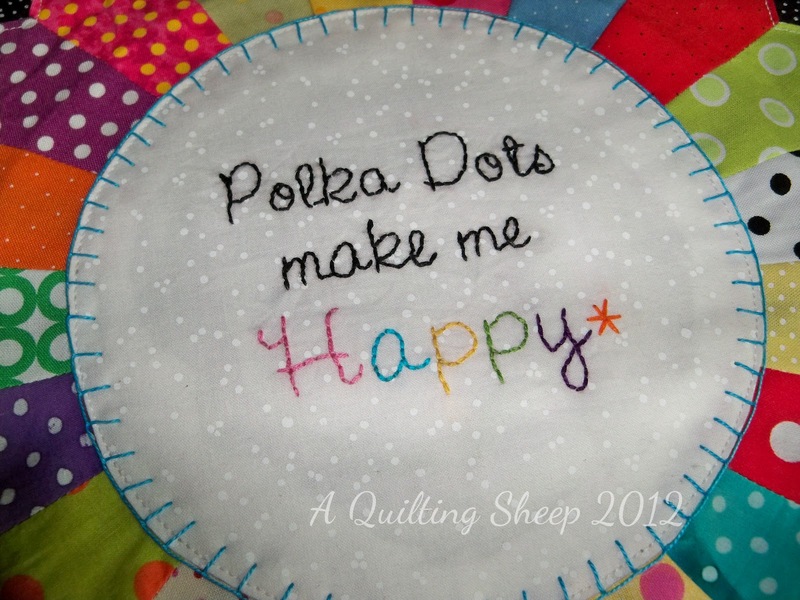 Dots make me happy too and I love your dresden block it is so cute. I think a pillow would be adorable. Polka dots make me happy too! Great block! I recently made my first Dresden Plate. I am hooked and the dots...perfect! Thank you for sharing! Polka Dots make me happy, in the grin-until-my-face-hurts kinda way... ;o) Awesome block. This is beautiful. I love all the dots and fabulous embroidery in the center. Thanks for sharing. Beautiful dresden dots!! Thanks for sharing. What??? You love dots? Who knew? LOL Love your Dresden dot block. And your hand stitching is beautiful. I love your dotty Dresden block!!! Gorgeous!! Love your block!! Dots make me happy too! Thank you for sharing your creativity with us. Blessings. Your dotty dresden plate block is beautiful. I love dots too! I love how your stitchery brings out the dresden. I have been away for a few days and I am glad to check up on what you have been doing. Enjoy your weekend! What a lovely block! Great use of colors! bleeeeeeat! Your dots make me happy, too!! Sew Cute! I'm rooting for a wall hanging, but, it will be cute whatever you do with it. Have fun in NYC. I LOVE IT!! What a great way to show off all of those dots!! Great Dresden Plate... possibilities are endless.